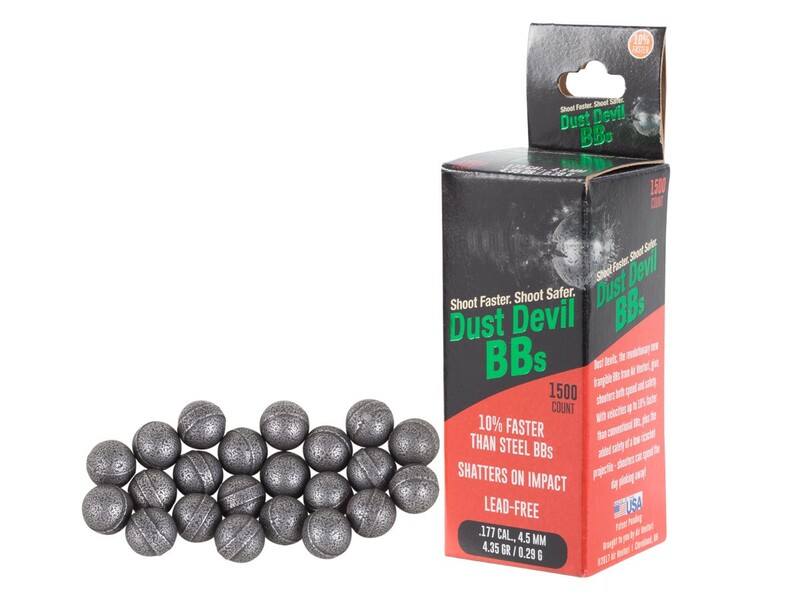 Questions & Answers: Air Venturi Dust Devil Frangible BBs, 1,500 ct.
Customers Q&A on Air Venturi Dust Devil Frangible BBs, 1,500 ct.
How many fpe is needed to break the bb ? Can the bb be used in a rifle barrel without doing damage to the rifling ? Is the material used made out of the alloy that are used for the alloy pellets that are made for rifled air guns ? They have been tested with as little as 140 fps and broke against a metal target. Yes, they can be used in rifled barrels without issue. 2x4, they definitely will not break. You have to shoot at something harder than the BB. So the frying pan should definitely make them shatter. Are you sure you are not feeling/seeing fragments come back as opposed to entire BBs? What will happen if you shoot a brick or concrete wall ?? Will they work in a Baikal drozd bumblebee "clip" not the hopper? What kind of bb guns don't they work in? I think the "ammo-shape" in specifications is incorrect. So these BB's do not penetrate is that correct? They would not serve for eliminating rodents etc. correct? Frangible means that they will break apart on a surface that is harder than the BB (so metal targets). They will still penetrate soft materials or put holes in paper. I don't recommend BB guns for pest elimination, so I wouldn't recommend these for that purpose. how will these work in a rifled barrel? Will these work in a Umarex MP 40? Will they break glass bottles or a window? That narrow, raised belt that encircles the BB worries me that it will make the flight erratic? Two questions: (1) Are these magnetic so they will work with a Red Ryder feed system? (2) Does the edge from the band around them scratch barrels?